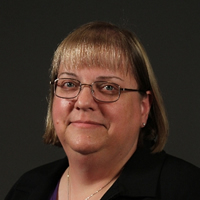 Karen Yeadon, Manager of Environment, Health & Safety; Rosemount Inc.
Karen Yeadon is Manager of Environment, Health and Safety for Rosemount Inc. During her 25 years in the EHS field, Ms. Yeadon has held a variety of positions in the private and public sectors. In her current position, which she has held for 11 years, her responsibilities include managing programs for Rosemount's 17 manufacturing locations on four continents. Her role has expanded in recent years to include global regulations and directives, and targeting the substances used in the production of finished goods. Ms. Yeadon has a dual Bachelor of Science degree in Chemical and Metallurgical Engineering from the University of Minnesota and a master's degree in Management of Technology from the University of Minnesota's Technological Leadership Institute.